You know those “All About Me” booklets they have you do in Kindergarten? You draw a picture of yourself, your family, your house, and a bunch of your favourite things. (Do they still do this?) My first couple of pages looked a little like this: Stick drawing of me, with super-long hair, another stick drawing of my parents and brother and a square with a triangle roof for my house. Then we would get into the favourites. My drawing of my favourite food was brown lumps and worm-like lines. Guesses? Potatoes and noodles forever! I love them both and if I had to declare one true food love it would be a fight to the death. How can you choose? They’re both carbs, they’re both a wee bit unfashionable, and they’re also both the best bases for building up with flavours and textures. 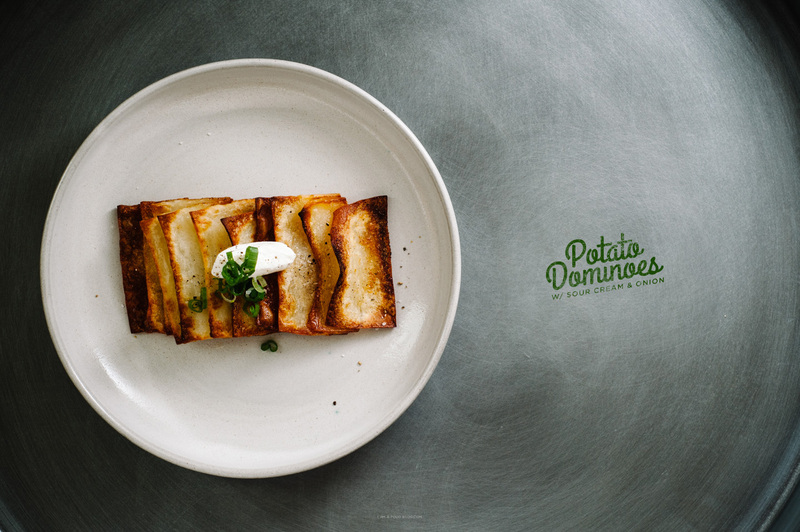 If you love potatoes, or heck, if you love yourself, make these potato dominoes. They won’t disappoint. Is this not the sexiest potato you have ever seen? Peel the potatoes and then trim all four sides so the potato resembles a brick, reserving the scraps for mashed potatoes or other such things. 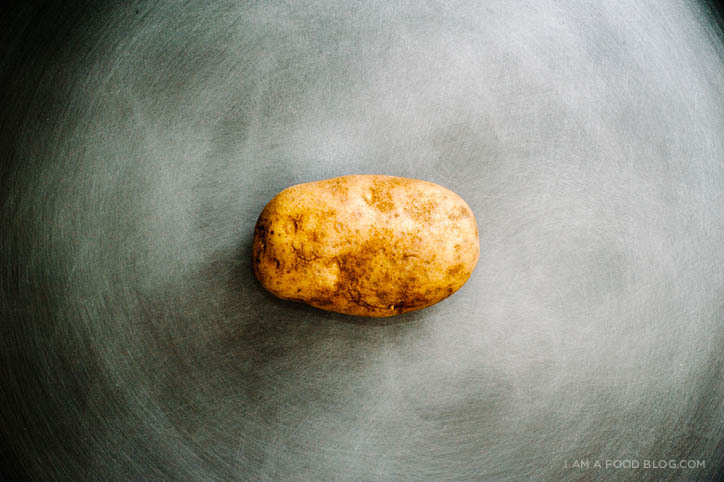 Slice each potato into into 1/8 inch thick slices, keeping the slices together. Fan potato slices onto a lined baking sheet. Dot each stack with 1 tablespoon of butter and a sprinkle of salt and pepper. Bake for 40 minutes, or until potatoes are brown on the edges and tender in the middle. Enjoy immediately with sour cream and sliced green onions. Potatoes and noodles forever indeed! This is such a neat recipe! Your potato and noodle story is the cutest! And your photos (and description) of these are making me so hungry. My sister made domino potatoes for us once, holidays I think…. after they appeared in Bon Appetit. (So, I imagine it was a fussy recipe.) This is awesome, I want to try! Dinner tonite?! Now this is……food art…just perfect. Congrats !!! Yum! I’m sitting here slovenly eating potato chips right now (they are cooked in olive oil at least), BUT I wish I had some of these instead! 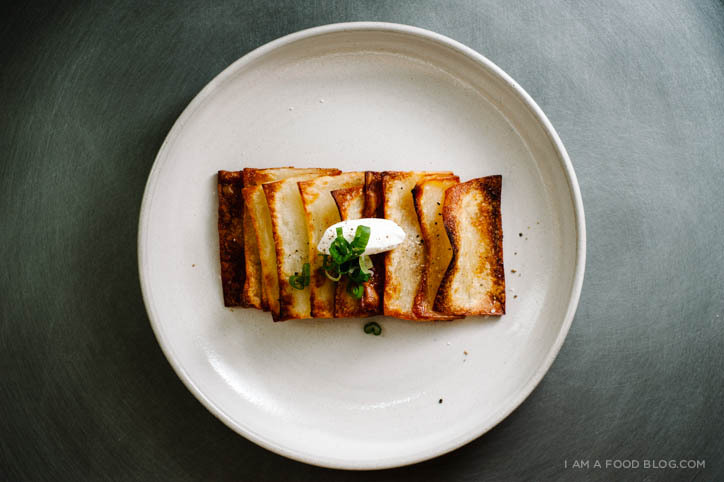 Beautiful Photography of this dish and you nailed it for the recipe name! CONGRATULATIONS to being a finalist on Saveur! I can see why you won. You’ve got some great recipes. 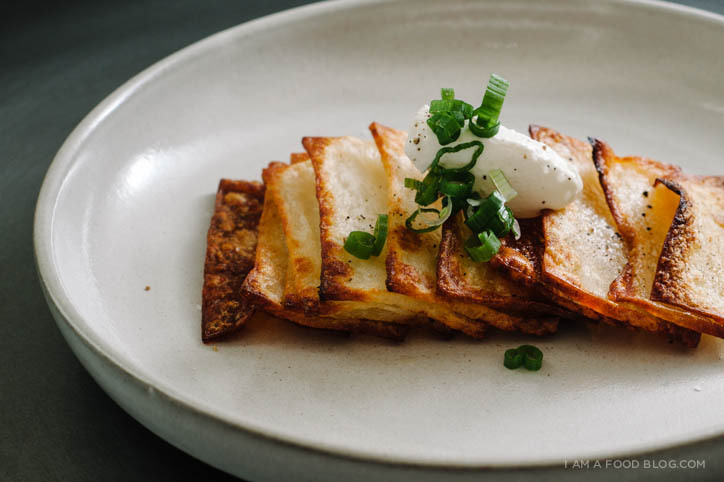 You’ve inspired to make ‘potato dominoes’. However, I will be making it with sweet potatoes and putting a little twist on it. Mmm, sweet potato dominos sound amazing!